The 1960s TV comedy Hogan’s Heroes featured a group of Allied World War II prisoners of war (POWs) who were housed in a camp run by a bunch of bumbling jailers. The POWs were able to strike against Germany from the camp due in large part to the predictable routine of the guards’ patrols. Led by “Sgt. Shultz” (played by actor John Banner), the guards followed the same routine every day and night. In simplest terms, the POWs knew that every day at 10 a.m. the guard patrolling the southern part of the camp would be turning at the watch tower. They used this information to send patrols out of the camp with great success. The success of the POWs was primarily due to their jailers’ tactics, techniques, and procedures being so predictable that they could be easily exploited. Fast forward to 2012, the U.S. Coast Guard is tasked with securing the nation’s vast Maritime Transportation System (MTS). The MTS is comprised of 361 ports from the St. Lawrence Seaway and Great Lakes chain, to the East, Gulf, and West coasts, and the western rivers. With a force of about 40,000 military personnel performing 10 maritime missions in addition to its ports, waterways, and coastal security (PWCS) mission, the service is spread thin, with less than a handful of patrol assets available in most ports – ports that encompass large geographic areas spotted with population centers and critical infrastructure. Obviously Coast Guard security forces cannot be everywhere all the time; their only option is to conduct patrols. Opposing them is an almost invisible and patient enemy seeking to carry out asymmetric attacks when and where they can. Against such a threat, the last thing the service can afford is to patrol like the German guards in Hogan’s Heroes in predictable and therefore easily exploitable patterns. Their alternative: Keep the enemy guessing and perhaps hesitating by conducting random unpredictable patrols. 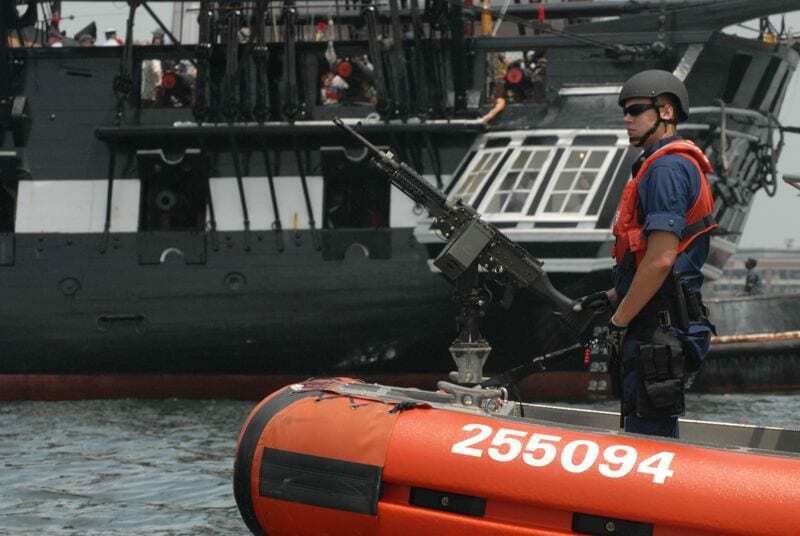 This article describes the Coast Guard’s efforts to develop an effective randomization protocol called the Port Resiliency for Operational/Tactical Enforcement to Combat Terrorism (PROTECT) Model. Before discussing the PROTECT Model, it is important to understand the criticality of the PWCS mission. The U.S. ports serve as critical portals for the international trade that sustains the nation’s economy. The importance of the MTS was highlighted in the Coast Guard’s 2012 Posture Statement, which noted, “With nearly 90 percent of the increasing global trade moving by sea, much of it fueling U.S. jobs and industry, our Nation’s economy and security are inextricably linked to the sea, our ports and our waterways.” In 2010, goods imported through U.S. ports were valued at $1.9 trillion dollars, with 13 million American jobs directly affected by this commerce. To ensure this vital cog in the machine of America’s economic engine continues to operate unimpeded in an environmentally sound and secure manner, the Coast Guard is executing its PWCS mission. These maritime security operations are designed to detect, deter, prevent, and disrupt terrorist attacks and similar criminal acts. In support of this mission, the Coast Guard conducts about 37,000 waterborne patrols each year near critical structures, from nuclear power plants to major bridges. In addition, they conduct more than 46,000 recreational vessel boardings, many in the vicinity of these critical structures, always vigilant for anomalous behavior that might suggest a security threat. The PWCS workload is immense so it is imperative to optimize every minute that a Coast Guard patrol is under way. The need to meet mission requirements while balancing operational capacity to ensure resource optimization and convey uncertainty to the adversary is at the crux of the PWCS mission. The service’s two operational commanders – commander, Coast Guard Atlantic Area (LantArea) and commander, Pacific Area (PacArea) – are well aware that portions of the PWCS mission, including critical infrastructure patrols, need to be randomized in a manner that accounts for the competing components of a port, the risk inherent in specific infrastructure, and the physical attributes of the port itself. They understand how crucial the need is to randomize these patrols to prevent any predictability that would provide an advantage to the enemy.